This handbook is written for activists who are interested in becoming organizers, organizers who want to develop their local chapters, and anyone who wants to learn more about Direct Action Everywhere. Activists march in Salt Lake City in support of open rescue. Every one of our organizers and chapters share a mutual set of core values that guide our activism and the way we interact with each other. Take the time to learn more about our core values. If these values resonate with you and you regularly take action - you are part of DxE. Direct Action Everywhere stands out from other animal advocacy groups for a variety of reasons, but perhaps one of these reasons is because our strategy and tactics are so different from the norm within the animal rights movement. DxE uses lessons from social science and from previous social justice movements to build the most effective movement for animals. We use the proven tactics of nonviolent civil resistance, social influence and mass mobilization to create a world where every animal is safe, happy and free. Activists rescue hens from a Whole Foods egg farm in broad daylight. Instead of focusing on creating individual vegans and celebrating new vegan products, we focus on making activists and changing social norms and political institutions. We believe that activism, not veganism, is the moral baseline. Veganism is simply the non-participation in violence whereas activism is actively resisting violence and fighting for justice. Studies have shown that revolutionary change can occur with as little as 1-2% of the population taking action and that every movement that mobilized 3.5% of the population was successful. We believe that a focus on individual consumerism may actually distract from the issue of animal exploitation and allow companies like Whole Foods, who cater to vegans but hurt animals, to avoid criticism. By focusing on making activists, we empower everyone to do as much as they can to help animals. Community is key to sustaining and nurturing empowered, and ultimately, effective activists in the movement. Research by social scientists like Nicholas Christakis and Duncan Watts have shown that powerful networks were integral in the success of past social movements. Every successful social justice movement was built on already existing communities - the LGBTQ rights movement from gay and lesbian community centers (1,2), the Civil Rights Movement from the Black Church, and the women's suffrage movement from women's clubs. Research tells us that social values are spread via social networks and personal interaction. Your family and friends influence your political, religious, and personal beliefs far more than anyone else. What this means is that if we want to instil anti-speciesism values and reduce the characteristically high recidivism from our own ranks - we need to focus on building robust communities. Interested in learning how we systematically build communities? Read more here. Nonviolence is both a strategy and a way of life. It is the foundation of everything we do at DxE. We are nonviolent in our action, our word and our tone. We aim not to "win" or "beat" people but to bring everyone into our beloved community. While many people have practiced and developed the philosophy of nonviolence, we are heavily influenced by the work of Dr. Martin Luther King, Jr. Several DxE organizers are certified Kingian Nonviolence trainers and host frequent trainings. If you are interested in attending a training or hosting one in your city, email chris@directactioneverywhere.com. Open Rescue, a tactic started by Patty Mark and Animal Liberation Victoria, stands in contrast to the more common form of investigation in the U.S. animal rights movement in which an investigator poses as a farm worker to film using a hidden camera. In Open Rescue activists openly enter farms, usually at night, document the conditions and rescue animals. While investigations and rescues are initially kept confidential, information is eventually released along with the identities of the activists involved. Open Rescue allows the portrayal of individual animals’ stories. During a rescue, activists focus on animals in the farm and rescue animals who would otherwise die of disease – and thus are of no economic value to the farm – so that their recovery and their story can be documented. We do not hide our identities because we are proud of what we are doing and know that we are taking morally just action. Being a public face to an investigation breaks down the stereotypes of animal activists as criminals, vandals and terrorists. We believe that Open Rescue extends far beyond the moment in time where an animal is rescued. It involves community building for support, protests in response to rescues, animal care, press work, etc... While we believe that Open Rescue is a form of activism anyone can undertake, it is critical that people are trained correctly as open rescue can pose serious health and legal risks. We offer trainings at least once or twice a year in the SF Bay Area for those who are interested in joining the Open Rescue Network. Our goal is thousands of open rescue teams across the world. DxE has released dozens of open rescues, which you can see here. Inspired by both activist networks and street theater groups such as Improv Everywhere, DxE mobilizes masses of activists to creative protest in prominent public spaces. Protests typically involve disruption of an event or place that justifies violence towards animals. Activists will stage creative street theatre, perform speak outs, sing, leaflet, chant, etc.... Creative protest disrupts people’s daily routines, forcing them to pay attention and engage with the issue of animal exploitation. They get the issue of animal rights on the table in order to eventually spark a national debate on the issue. While protests are not popular, they work. We historically target companies and institutions who claim to sell products with superior animal welfare standards such as Whole Foods Market and Chipotle. We criticize these companies for lying about the actual conditions on their farms and using these conditions to deceive customers with the idea that it is possible to raise and kill animals in a humane way, which we reject. We believe that “humane meat” is the wobbly linchpin holding together the whole system of “meat”. Our messaging is aimed at putting ‘anti-speciesism’ into popular parlance and about amplifying animals' personhood and dignity. For these reasons, we do not typically use “graphic imagery”. In all of our messaging, we make clear that the problem extends beyond a single target and industry. We have used several themes in our protests and media, including Until Every Animal is Free, It’s Not Food/Science/Fashion, It’s Violence; Disrupt Speciesism; and What Animals Deserve. While DxE does have a formal organization, we also exist as a platform. Everyone who takes action in accordance with our principles and values can call themselves DxE. We aim to share many of our materials and knowledge with the public. Our formal organization does offer structure for chapters who want it. We organize monthly days of action, offer trainings, connect organizers through social media, and host monthly strategy calls. DxE holds a day of action every month. Model action plans and themes are provided, but every chapter is welcome to organize an action of their choosing. We support activists in disrupting any place that normalizes, profits from, and promotes violence against animals; especially establishments that go out of their way to market violence as ‘humane’. Protests are often held at grocery stores, but other establishments have been targeted as well. Many chapters host multiple protests each month. Local chapters host monthly community events, which could be potlucks, movie screenings, discussions, etc... We emphasize and encourage DxE chapters to volunteer at sanctuaries, shelters and rescues on a regular basis. We offer a variety of trainings to activists and organizers. Some take place in person and some take place online. We also have Bay Area organizers who travel to different chapters to provide trainings if there is sufficient demand. We are a grassroots organization made up of people like you! Our organizers are dedicated activists who decide to make speaking up for animals an important part of their life. All you need is two people, a sign and a smartphone to do your first action. Our mentors are ready to guide you through the process, from materials to camera work to promotions. E-mail mentoring@directactioneverywhere.com to have a call with one of our mentors. Participating Chapters are chapters who have completed at least one action, commit to continued organizing and community building, and whose organizers sign onto DxE's principles and values. You will be added to our organizer’s Facebook group and mailing list and invited to our monthly strategy calls. Seed Chapters are communities which have organized into a political force for change. They continue to participate in regular actions, community events and strategy calls but have also developed the capacity to enact social and political change in their city/community. submit a defined mode of governance, with bylaws describing how decisions are made; commitment to DxE’s values must be enshrined in governance. Organizing actions can seem stressful, but we're here to help you out. We've listed some of the critical elements below. The SF Bay Area Protest Working Group uses a checklist to organize actions (LINK). While some items may not be relevant for your chapter, the checklist can be very helpful when organizing actions. Stephen, an activist from Vancouver, holds up a "We Are All Animals" placard. It's important that all DxE actions are nonviolent and in line with our principles and values. If you have any questions, or need help with any aspect of action planning, email mentoring@directactioneverywhere.com. Assign the protest marshal (point person) and pick a date, time and location. Scout the location beforehand. This means knowing the layout of the store or place you plan on protesting, how activists will enter/exit, where people will stand, etc... Pick a meeting location that is close to but not directly visible from the protest target. Create a Facebook event page as soon as possible. Make sure you include all information, including the date, time and meeting location (remember, this is not the exact protest location). We make most of our event pages public, but sometimes you may want to create a private event page. Invite people to your Facebook event - as many people as you can! Private message people, post in the event page regularly, and post in local vegan/animal rights groups. Consider leaving posters or flyers in places where animal advocates gather. Continue to promote right up to the day of the protest. As the marshal, you should have a well-developed plan before the day of the protest. What will people do during the protest? How many people will speak? Will there be a creative visual? Assign who will be speaking, leading chants, filming, etc... beforehand and make sure you remind people leading up to the protest. Also assign a police liaison who will be responsible for talking to the police should they arrive and a media liaison who will talk to the press if they are covering your action. Animal-focused. Our cause is animal liberation, and animals should be the focus of our speakouts. Our actions should center their perspective, not the benefits to the oppressors (i.e. humans). Systems, not individuals. Target oppressive systems, governments, corporations, etc. that lie at the heart of animal exploitation. Occasionally we can leverage an individual's notoriety to bring attention to this issue (i.e. Chris Christie), but avoiding personal attacks helps us stay on message. Storytelling. Tell animals' stories. Show them to be individuals, and do it proudly and passionately. Avoid oppressive language. Take care to not use phrases or words that hurt others or detract from other anti-oppression activism. Examples include sexism, racism, ableism, etc. (A few tips here). We will make mistakes, so remain humble, listen to criticism, and keep learning, growing, and going. Justice. This is about justice, and we shouldn't be afraid to say it. Empathy and compassion are great, but ultimately, whether or not we care for them, all animals deserve freedom. Memorize and project. Memorize your speakout. This will make it more natural, engaging, and camera-friendly. Project, don’t yell; maintain control while speaking strongly. Be clear, and concise. Inspire activists. Our main goals are to inspire activism for animals and provoke public dialogue. Persuading individuals to go vegan is great but is not typically our main objective. Ultimately, we want to inspire a mass movement of people to speak strongly for animals. Materials are available on our site on the Materials page or in the campaign guide if you are participating in a coordinated day of action. If you are planning on sending out press advisories or releases, feel free to contact our press coordinator Matt at matt@dxe.io. You can also use this press guide to help with all manner of press work. Do the action! As the marshal, it's your responsibility to ensure it is executed smoothly and you address any issues that arise. Return to the meeting location, thank everyone for coming, and encourage people to share how they are feeling. Make sure everyone knows when the next action will be. As soon as possible, post the photos/video to social media. We encourage folks to organize fun social events after protests, like going to eat at a vegan restaurant. Look forward. Don't be too busy. Hold your signs steady, and the right way up! Speak with ONE voice. Don't get distracted into separate arguments. Try out camera prior to the action - make sure it works and you are comfortable with it! Focus on faces - don't get the back of heads. Don't talk as a camera person. Try to have all cameras to be at least iPhone quality. Primary camera NEEDS to get good shots of the entire demonstration - but also get some close-ups of activists' faces! If you are filming someone on a megaphone, stay at least 5 feet away to avoid feedback noise. The camera person is preferably in the position of an observant rather than a participant. For reasons mentioned earlier, building a strong, supportive and empowered community of activists is essential for a sustainable and effective social justice movement. We focus on building local activist communities as well as connecting activists from different chapters and different parts of the world. 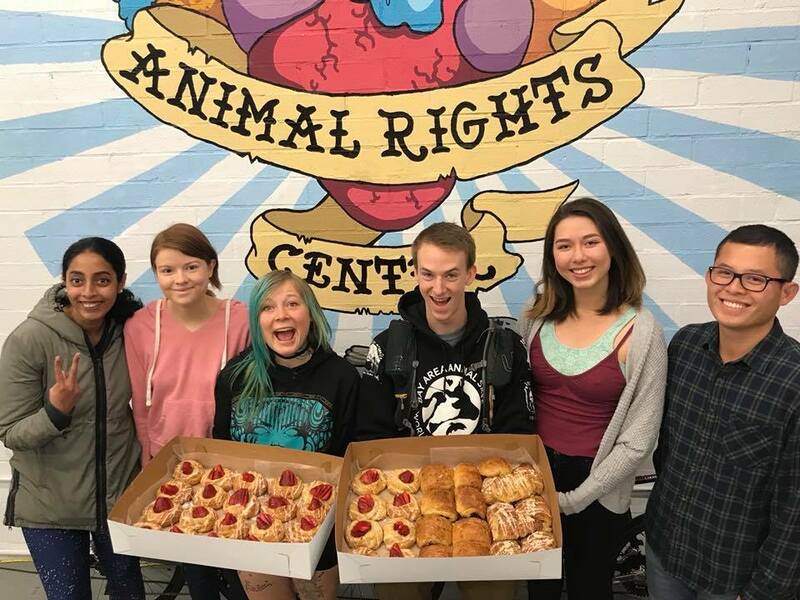 Activists enjoy vegan pastries at the Berkeley Animal Rights Center. In the Bay Area, we host community events all the time! We are blessed to have a large community and our own space - the Berkeley Animal Rights Center. We strive to offer some events that occur at the same time and same place every week, e.g. we host Saturday morning Meetups every week at 11:00am. Most other chapters host one community event a month. These events could be a potluck, movie screening, hike, restaurant outing... the possibilities are endless! While most of these events are primarily focused on community, we often spend 5-10 minutes talking about activism and promoting upcoming protests. Successful movements are powered and sustained by deep, and empowering relationships between activists. DxE Connections is a simple program aimed at building these deep, meaningful friendships. The mechanics of Connections is simple: Two activists visit 1 other activist and meet for an hour – a “Connection.” All other factors of the connection are flexible: activists have connected over coffee, over food, on a walk, while cooking together or even while protesting together! Organizers are encouraged to spend some time in small groups with activists, especially new activists, to ensure they feel supported and empowered. Email is the primary way we send out general notifications, especially information relevant to our current campaign and monthly Day of Actions. If you are involved in our international campaigns - we will add you to our mailing list for campaign related information. If you are not getting emails about our campaigns, and you think you should - contact mentoring@directactioneverywhere.com. Direct Action Everywhere Facebook Page - This is our public face of Facebook, where we share content in support of animal rights and showcase highlights of the works our activists do. It is also this page where we host our Monthly Day of Actions. We hold a monthly strategy call to share developments in our network, to discuss the new projects we have been working on, and to highlight activists in our network. The strategy calls happen on the first Sunday of every month at 10:00am PST and are a requirement for all DxE Organizers. The ALC (previously the DxE Forum) is an annual week-long convergence that occurs in late May where organizers and activists from around the world come together to connect, reconnect, and engage in communal learning for one ultimate reason - to become better advocates for animals. You can find out more at liberationconference.com. 1,000 activists marched in San Francisco during the 2018 Animal Liberation Conference. Activists investigate an egg farm during the 2018 Animal Liberation Conference. DxE is more than a day of action here and there. We inspire activists to build thriving and self-sustaining communities for animal rights that have the ability to influence social norms, political opinion and laws. Once your chapter has the basics down, e.g. organizing monthly actions and community events, you may want to start thinking about how to develop further. This typically requires chapters to develop a solid core team of organizers. Sometimes, setting up a core team is as easy as putting a call out to dedicated activists who are able to meet the proposed standards and fulfill the responsibilities. Other times, it may be difficult to find people who are able or interested. If you need help finding a core team of organizers, e-mail mentoring@directactioneverywhere.com. We will help by setting up a meeting with you, activists in your city, and an organizer from a well-developed chapter (via Skype). In this meeting, we can further explain the mission, vision and tactics of DxE and work with your community to enable people to become involved as organizers. Once you have more than a few organizers, you may want to start organizing working groups in your chapter. Working groups are subsets of organizers who are responsible for a specific task in your chapter, e.g. protest working group, fundraising working group. There are also some working groups that are made up of organizers from different chapters because they cover aspects of the whole network, e.g. social media working group, legal working group. Anyone who officially joins a working group will also be asked to sign onto the organizers's agreement and is considered an organizer. If you have questions about starting working groups in your chapter or joining a global working group, email mentoring@directactioneverywhere.com. Many chapters strive to successfully complete an open rescue. In order to do this, you need a solid team of activists that you completely trust (even with your life!). You also need skills in research, scouting, animal care, press work, videography and more. It is highly advised that you do not attempt a rescue without proper training. Most chapters receive this training at the annual Animal Liberation Conference. If you have questions on how your chapter can get involved in open rescue, email openrescue@directactioneverywhere.com. Through Compassionate Cities, we are beginning to work on legislative and political goals. Chapters should strive to eventually be able to influence local legislation and can email info@compassionatebay.org for information. As mentioned previously, DxE is a platform for anyone who wishes to take action in accordance with our principles and values and some chapters operate completely independently of the formal organization known as "DxE Global" or "Direct Action Everywhere". Other chapters sign onto an organizer's agreement and meet certain other requirements to be considered Participating or Seed chapters in the organization. You can read the details of our organizational structure and requirements for being a chapter in our bylaws (LINK).